50-60% of students don't get accepted to medical school. How do you become one of the "lucky" ones to get in? You make yourself stand out through the stories you tell in your personal statement and extracurricular descriptions! The personal statement can make or break your chances at a medical school interview. Just because you have a 4.0 GPA and a 520 MCAT does not mean you'll automatically get an interview invite. Your personal statement is what sells the admissions committee on whether or not the school should invite you. Ryan brings the most valuable assets in the medical school admissions process: honesty and experience. His focused advice was key in helping me create a truly compelling personal statement. – Ryan Ga.
With rolling admissions to most medical schools, you need to make sure you apply as early as possible. The earlier you submit, the sooner your application is complete and the sooner you can get your interview invite! You'll get two revisions of your personal statement, extracurriculars, or both, and the support you need to write the best personal statement so the admissions committee knows who you are, why you want to be a physician and what you will do with that degree in the future. After having worked with hundreds of students, there have been a couple of students who weren't happy with the feedback they received. If you are not going to enjoy hearing that you should probably start over, or that a story that you really love doesn't come across well in the personal statement and you should change it, then this editing may not be for you. You also won't get your personal statement written for you. I don't write anything in your personal statement. I give you feedback on what you have written. The feedback I give is more high level—what is your personal statement telling the reader. Is it doing its purpose of showing the reader why you want to be a physician? If you are looking for the more in-depth nitty-gritty, or if you're looking for help rearranging sentence structure, I'm not that person. If you want to make sure your personal statement is doing the best job possible at showing who you are, that's where I can help. I highly recommend Grammarly to help with writing your essays and emails during this time! Personal statements that we've helped students craft have been the highlight of many interview days. One student interviewed with the dean of admissions and he told her that her personal statement was the best that he had ever read! Her initial draft was completely scrapped. Another student who interviewed at Harvard and other schools said that his personal statement and the story he told in it has come up at every interview. Having Problems Getting Started? Don't Know What to Write About? If you're having problems just getting started, you can schedule a one-on-one session with us to help you start to draft your personal statement. I'll have you fill out a short form to give us some ideas about who you are and give me a rough draft if you have one. Then we'll jump on a 30 minute Skype call to flush out some ideas. After that, we'll review two drafts of your personal statement and give you feedback on how you can make it stronger! Need Help With Your Extracurriculars? Did you know that I think the extracurricular descriptions are actually harder to write that the personal statement? With the personal statement, you get 4,500-5,300 characters to tell your story. With extracurricular descriptions, you need to tell a story in 300-700 characters! Don't worry. We can help you write those as well! Because there are many more extracurriculars and each one tells a different story, editing takes longer and therefore is more of an investment. *Using this service gives Medical School Headquarters the right to use your essays and extracurriculars, in whole, or pieces, for educational purposes in future videos, books, social media posts or anywhere else. All identifying information will be changed prior to use. If you don't want us to use your essays or extracurriculars, please email us at team@medicalschoolhq.net before your first edits are sent to us. This will allow us to create more great information for students in the future. Need everything done for your application? Because so many students have asked us if we discounted services if you bought both, we decided to do it! 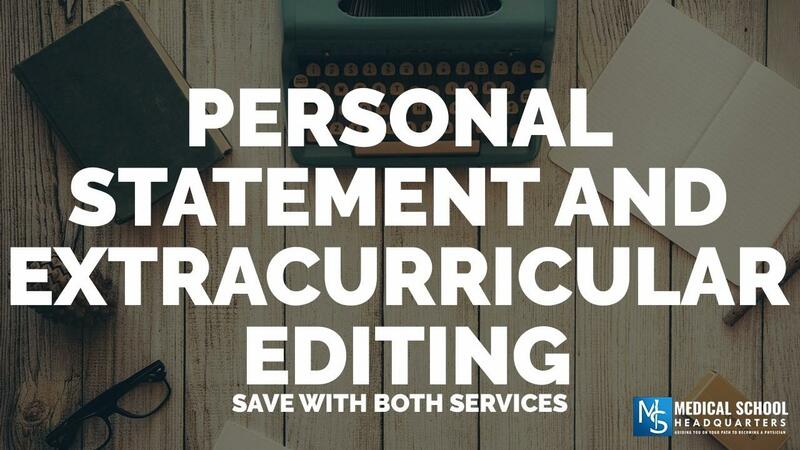 Save $125 by having us edit your personal statement and extracurriculars. You'll get two rounds of each edit. LIMITED IMMEDIATE AVAILABILITY - Please email me if you need something quick to make sure I can accommodate you. Not sure where to start with your personal statement? This is the service you need! Jump on a call with us and we'll discuss with you your motivations for wanting to be a physician. We know how to "extract" your story out of you. After the call, you'll get two rounds of edits to make sure you're telling your story well. Have an expert look at your personal statement and give you feedback on how well you are telling your story. Don't expect a perfectly edited essay in terms of grammar. We're experts in making sure that your story is coming across. That it shows them why you want to be a doctor. You'll get two rounds of edits. Need help with your ECs and most meaningful statements? This is the service you need. The best ECs don't just tell me what you did, they also show my why. Don't make the mistake of writing a boring description. Let us help you capture their attention.